Home » TSE Podcast Post Page » TSE 967: How Does The Statement “Unless You Are Breaking Stuff, You Are Not Moving Fast Enough” Apply To Sales? 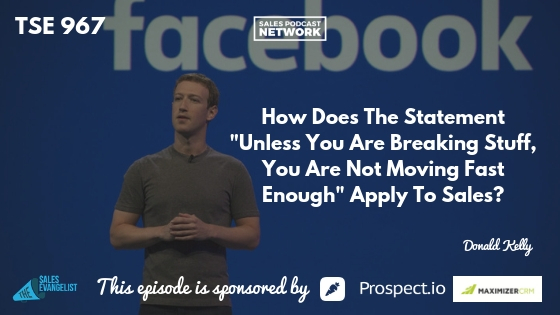 On today’s episode of The Sales Evangelist, we discuss the idea that if you’re not moving fast enough to break things, then you aren’t moving fast enough, and how that statement relates to sales. Human beings like comfort. We don’t like to change things. We really don’t like it when a new sales trainer comes in, or when our company changes its processes. We like consistency. We like the status quo. That’s why one of the greatest challenges as a sales professional is our responsibility to help our prospects recognize the need for change. For us as sales professionals, we also like to keep things the same, even when those processes we’re clinging to aren’t the most effective ones. I think Mark Zuckerberg is trying to tell us that we need to be willing to try new things and to break some of the processes that we’re using. If we don’t, we’ll find ourselves selling the same way we always have, and other people will surpass us. If we refuse to break our processes, other people will find a way to outperform us. They’ll find a new approach that works better and they’ll pass us by. We have to recognize the flaws in our approach. If people offer a correction, we have to avoid being defensive. “I’ve been selling longer than you,” won’t get us anywhere. We must try new things and break the things that aren’t working. We have to do it quickly because a sinking ship will keep sinking if you don’t take steps to stop it. Look at your current sales process. Look at the way you’re currently reaching out to prospects. Are there things you could change to make them work better? Are there processes you could break to improve your approach? Get rid of things that aren’t working, and do it quickly. Put something else in its place. During my recent zip-lining trip, I got more and more nervous while I was waiting for my turn. I think if I could have gone first, I could have avoided a lot of the anxiety by taking action. Instead of worrying about all the bad possible outcomes, I would have figured out quickly that none of those things were actually going to happen. Fear often holds us back. We avoid trying new things, which means we miss the exhilaration of the challenge. 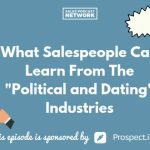 For sales professionals specifically, many of us don’t like prospecting. We’re afraid of it because we’ve imagined all the worst things that might happen. If we can step back from the fear, we often realized that even if the very worst happened, we’re still going to be ok.
Then, once you’ve found a process that works, don’t be complacent. Figure out how you can break the process to make it even more efficient. Once you’ve gotten to a more stable position, you can move fast with a table infrastructure. Whether it’s your prospecting, your closing, or your marketing, be willing to try something new. Continue to break your process so you can continually evolve. Blockbuster didn’t abide by this rule, and we all know where they are today.